Heat oven to 375°F. Grease bottom and side of 9x3-inch springform pan or 9-inch square pan with shortening or cooking spray. In small bowl, mix 1/2 cup sugar, 1/3 cup flour and the cinnamon. Cut in butter with fork until crumbly. Set aside. 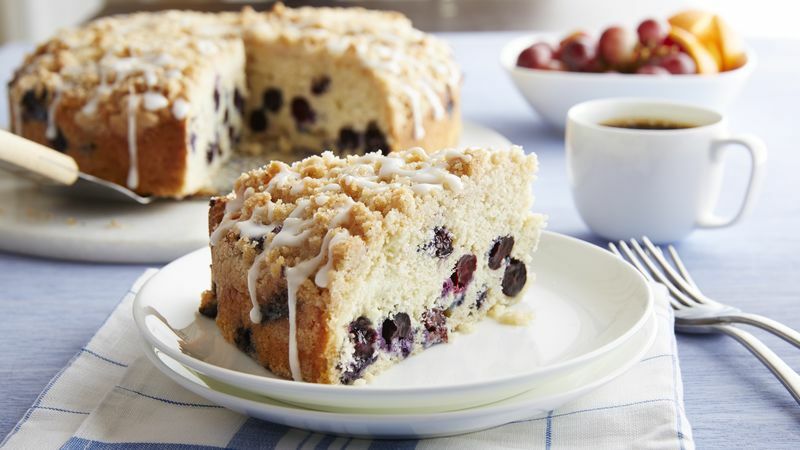 In large bowl, stir together all coffee cake ingredients except blueberries; beat with spoon 30 seconds. Fold in blueberries. Spread batter in pan. Sprinkle with topping. Bake 45 to 50 minutes or until toothpick inserted in center of cake comes out clean. Cool 10 minutes; remove side of pan. In small bowl, mix all glaze ingredients until smooth and thin enough to drizzle. Drizzle over warm coffee cake. You can tightly wrap and freeze the baked coffee cake for up to six months.